Used Alfa Romeo Stelvio Review - 2017-present Servicing, MPG, Insurance | What Car? 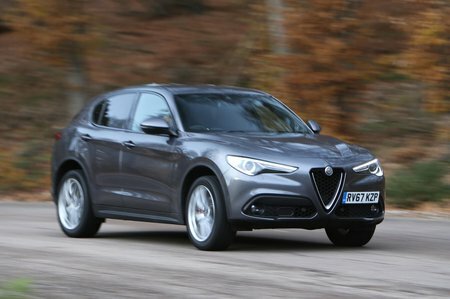 What used Alfa Romeo Stelvio estate will I get for my budget? Used Stelvios cost from around £32,000, this for a 2017 model, petrol or diesel, in Super trim, with a nominal mileage and a full history, bought from an independent dealer. Spend between £33,000 and £36,000 and you’ll have a selection of 2017 models of varying trims and with low mileages, while £37,000 to £40,000 gives you the choice of nearly new cars with either the lower or higher-powered engines, bought from franchised dealers with, in some cases, delivery mileage only. How much does it cost to run a Alfa Romeo Stelvio estate? Unsurprisingly, it’s the diesel models that are the most economical. The 2.2 180 is the only Stelvio you can get with rear-wheel drive rather than four-wheel drive, and this claims an average fuel consumption figure of 60.1mpg, with corresponding CO2 emissions of 124g/km. The four-wheel-drive version of the 2.2 180 returns a claimed 58.9mpg, as indeed does the 210 version. The petrol models all return a claimed 40.4mpg. All Stelvios will be registered after the tax changes of April 2017 came into force, and therefore will be taxed at the flat annual rate. However, beware those whose new price was above £40,000, as these will attract an annual luxury car tax surcharge. Insurance groups range from 30 to 36, depending on power output. Servicing costs vary between £170 and £330 for a basic service, depending on engine power and the mileage of the car, and servicing plans are available for used Alfa Romeos, enabling you to pay by direct debit and thus plan ahead for your outgoings.